Chinese New Year is a time for reunion, celebrations and feasting!! I haven't spent Chinese New Year back home for such a long time. 5 years in fact so what's the best thing to do to make myself feel better?? Bake some CNY goodies!! Didn't have to do so last Chinese New Year as my then fiance's father blessed us with loads of goodies when he came over. No 'special' delivery this year so I'll just have to bake some! Home baked goodies will definitely be better than the expensive ones being sold in Chinatown. Agreed? 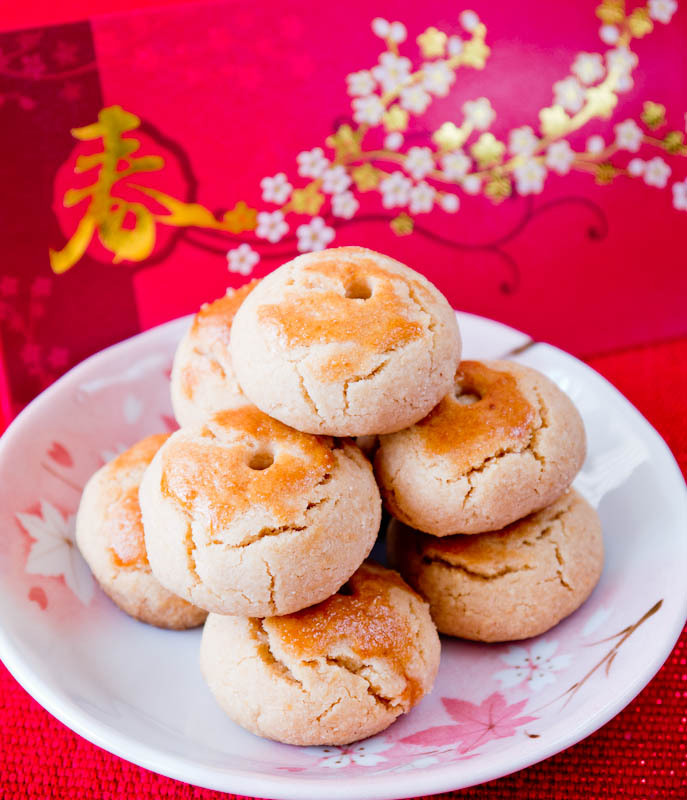 Almond cookies are one of the traditional cookies that's enjoyed during the festivities. It so happened that Su-Yin over at Bread et Butter posted up the recipe so i didn't have to look too far for a great recipe. The result of this easy recipe was a meltingly crumbly cookie with a pretty cracked appearance like what it should be. Simply lovely! 1. Dry fry the ground almonds in a wide non-stick pan (over medium heat), until they start to become fragrant and lightly browned, taking care not to burn the almonds. 2. Heat the oven to 180 deg C.
3. Place the ground almonds, flour, sugar and salt in a bowl, and mix with a spatula until well combined. 4. In a food processor, pour in the dry mix and slowly trickle the oil while pulsing, until a cohesive dough is formed. 5. Form the dough into 2cm balls, and place on a baking tray lined with parchment paper. Press down lightly with a chopstick or straw to form the indentation you see in the cookie. 6. Glaze lightly with the beaten egg. 7. Bake for 15-20 minutes, until golden brown. delicious! They look very nice! I love these cookies coz they are savoury and often so fluffy and light. Thanks for sharing your recipe. Give it a go soon and i'm sure you'll be very happy with it. And they look lovely, Sylvia. When is Chinese New Year this year? It's this coming monday, Jan 23rd. I don't remember trying this, maybe I did without realising. They sound awesome. Am sure you'll love this too! haha I definitely don't mind making them some of these beauties. Happy CNY! Gong Xi Fa Cai! wow 5 years is quite a long time to be away. I just baked peanut cookies too, haven't thought of making almond.. yours look so pretty! Gong Xi Fa Cai! Xin Nian Kuai Le!! I think peanut ones will taste even better as it'll be more fragrant. So pretty and surely delicious! I bet their texture is amazing. Thanks Rosa. The texture was nice and crumbly, just what i like. 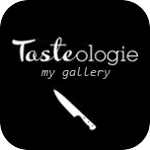 I am delighted to have found your blog! Thanks Lizzy! Am glad that you introduced me to your blog too! We really did and am planning to make some more to give to friends! Thanks for sharing the wonderful recipe! This sounds delicious! I am planning to bake these cookies too! Great!! Am sure you'll enjoy them too! Am looking forward to your post! and yes!! it's almost here!! Thanks for dropping by and for the compliments. Gong Xi Fa Cai to you and your family too! These cookies look so cute with the little holes! I love almond cookies, cakes, anything, so I'm sure I would enjoy them. Looks like you should give these a go soon! Until recent years I didn't know that almond cookies are related to Chinese New Year thing. I love almond cookies and I should make it from scratch one day as it sounds easy (for me) to make! Love your New Year presentation of these cookies - really beautiful. That's too kind Sylvia... I kind of burnt the cake that I baked the other day. I don't have much of common sense in terms of baking. I hope to improve my baking skills so I can bake with confident. =) Hope you are having good holiday! i love how simple and almond-y they are. almonds are my favorite snack :). hope you are having a wonderful week so far Sylvia! Thanks Junia. Enjoy the rest of the week! wow every Chinese New Year my neighbors send us some of this cookies and tikoy. 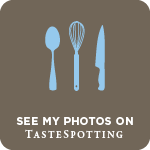 And it is nice that you post the recipe I love to try it. What beautiful little cookies! 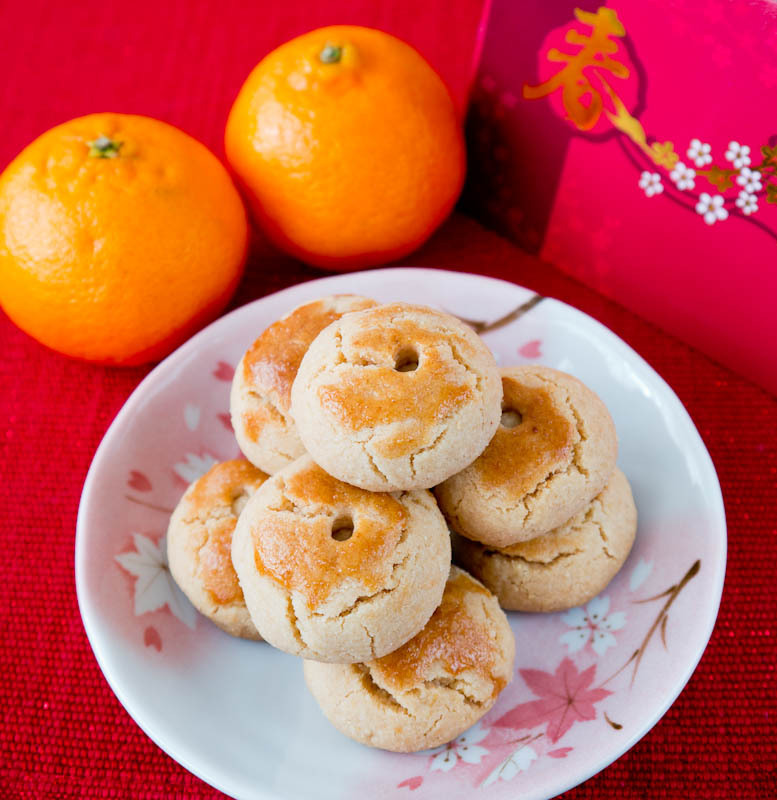 I didn't realize that almonds cookies were traditional for Chinese New Year, but then I don't know much about CNY. However, because of the mats that are used at a Chinese restaurant that I frequent, I know that I'm a dragon and 2012 is the year of the dragon. :) I should do something special next week, like make these wonderful cookies! They look simple enough for a non-baker like me and I know we'd love them. Have a wonderful CNY celebration! Thanks MJ! It's easy so you won't have a problem with it at all! Happy Baking! These cookies looks so beautiful and delicious!!! I love almond cookies, I love how simple yet delicious these are. happy Chinese year Sylvia. The cookies are looking great! Wonderful recipe! Can't wait to try it! They look delicious, but I'm curious... why do you indent the middle with a chopstick? They look awesome...would love to try! Give it a go and hope that you'll like them! Hi thanks for the recipe. Can i simply add the oil to the dry mix while mixing with, say, a spatula? I don't own a food processor..
What a great idea to use oil instead of lard or butter, right? Happy (almost) National Almond Cookie day! A Singaporean married to a Malaysian who lives in the UK and loves food, travel and photography!! !